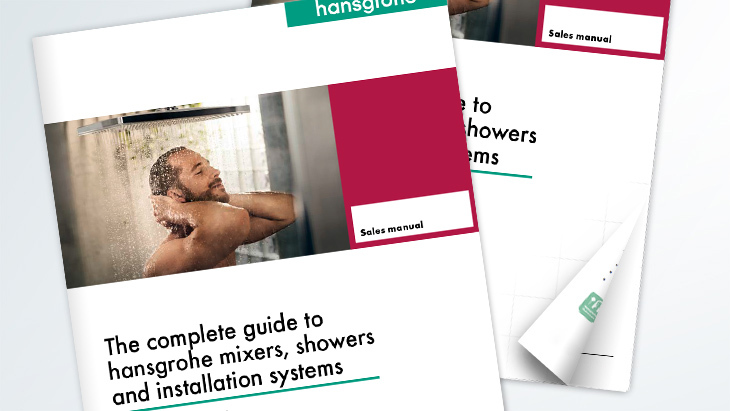 The hansgrohe Sales Manual is THE practical tool for all specialist partners within the bathroom and plumbing trade. It contains the entire range of products from the hansgrohe brand, including all the latest products, and serves as a complete compendium for detailed consultation and planning. It also offers all relevant information concerning technologies and operation. In short: the Sales Manual sets out the top key selling points – offering added value for any kind of sales scenario. It will therefore boost your sales opportunities and guarantee happy customers. NEW for 2017: All the important tips relating to installation planning and assembly can be found in this brochure. In a separate installation section, professionals will find plenty of illustrated examples of applications in showers and bath tubs. For example, using the iBox universal and the new ShowerSelect pre-fab sets. The wealth of information offered in the Manual has been put together based on intensive dialogue with our professional partners, as well as hansgrohe's own expertise. A huge amount of practical experience has therefore been put to good use in creating this book, which really does contain everything that you ever wanted to know about hansgrohe products. Showers and shower control systems. Here, professionals can get an overview of the versatility of hansgrohe’s modern shower range. Here, you can find out all about jet types and shower design, exposed thermostatic mixers and concealed solutions, user convenience and XXL enjoyment. Bathroom mixers. These are arranged by product line, so all the bathroom mixer taps can be selected to perfectly suit your taste and are easy to plan. Kitchen section. Product diversity and performance. Everything is explained in detail. Comprehensive product range overviews display all the key products within a category at a glance. Key product features are visually explained. Advantages and benefits. These are prominently featured for each product, so that the top key selling points are readily available. Innovative hansgrohe technologies. These are assigned to the ranges and clearly illustrated. Top technologies like “Select” or “EcoSmart” are explained in detail. Products for special target groups. These get their own section – for example Care or electronic mixers. Electronic mixers. From A to Z – all supplementary products are displayed. Concise information. This illustrates, in a nutshell, the meaning of hansgrohe quality and the outstanding services offered by the company. A list of all the digital assistants and exciting apps: whether you are interested in the online spare parts catalogue, the savings calculator, Hansgrohe@home, Hansgrohe@work or the Hansgrohe Showroom app.